When Online Registration is over you will want to denote accounts and members who will not be on the team. If the Account will stay active but not all of their children will be swimming you can easily suspend just one athlete. 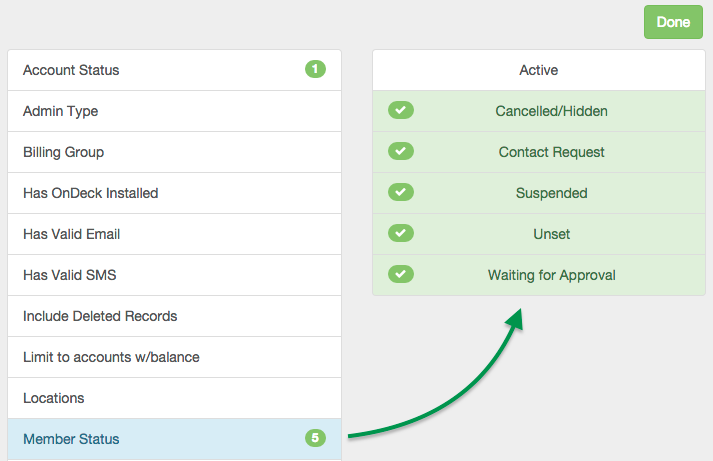 Click Manage by desired registration. Check the boxes by those whose status you want to change, or select all (check the box to the left of the "Member" column header). 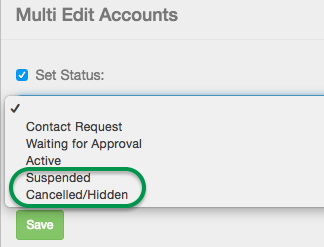 Select either Suspended or Canceled/Hidden. Both will have the same effect; it's up to your process. Generally we suggest Cancelled/Hidden for those never coming back—perhaps they are too old—and Suspended for those who may return later. You may optionally check Change "Inactive Date" and enter today's date so you know when you marked them this way. Click Account Status and make sure only Active is checked. Click Member Status on the left and check all statuses EXCEPT Active. 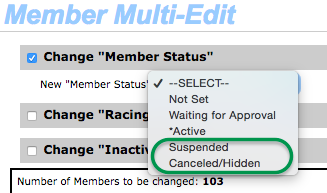 Set to either Suspended or Canceled/Hidden (see above for definition).